BISS CKC GCH/AKC/Intl ChMarauders Hey Jude "Jude"
Ataxia Clear By Parentage, OFA Heart, OFA Hips good. Jude is our keeper from the Ruger and Georgia Breeding. She entered the show ring for the first time in March 2015 and finished her Championship in 3 shows. She was virtually undefeated in the classes at the Nicola Valley Kennel Club and Vernon and District Kennel Club Shows with great success in Sweeps with runner up Best in Sweeps. Jude completed her International Championship in November 2015. She finished her AKC Championship with limited showings achieving multiple Best of Breed wins and Group placements in the Owner Handled category throughout 2016 and early 2017. 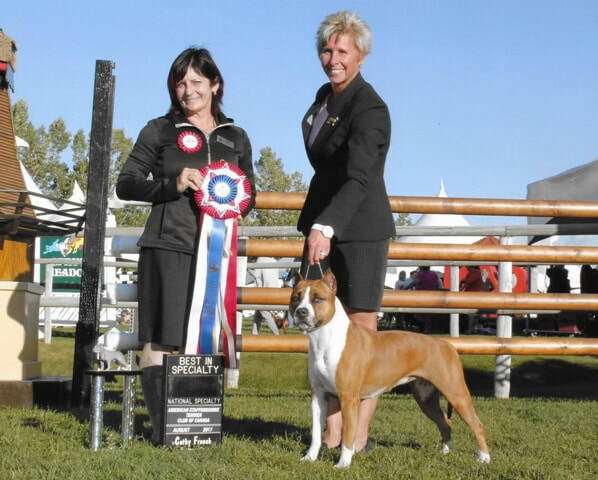 Jude started showing in Canada again the summer of 2017 with a BOB and Gr4 at the Kelowna Kennel Club shows and then went on to take BISS at the American Staffordshire Terrer Club of Canada Speciatly and BOS at the All Terrier Club of Alberta shows and the Alberta Kennel Club shows that she entered at Spruce Meadows, Alberta August 2017 achieving Grand Champion status. We plan to have some fun in rally obedience im the near future. Jude will be bred for the first time in the fall of 2017.